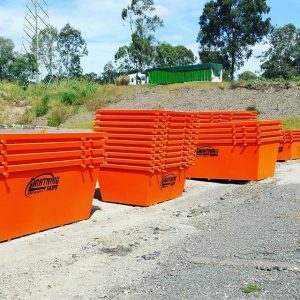 Should You Hire a Mini Skip Bin Hire in Brisbane or a Large Bin? Mini Skip Bin Hire Brisbane? Sooner or later, you’re probably going to have more waste on your hands than you know how to handle. Sometimes, our wheelie bins just don’t have enough space to accommodate all our junk. Especially if you’ve recently revamped or redecorated your home. You can hardly let waste sit gathering dust on your front lawn for months on end. But you don’t want to ruin your car’s upholstery by filling it with loose debris and junk. Fortunately, you can dispose of a large volume of waste quickly and easily by hiring a skip bin in Brisbane. Whether you’re revamping every room in your home, landscaping your yard or building an extension. You might need to hire the largest skip bin available to accommodate all the waste. Unfortunately, large skips use up a lot of your outdoor space, and if you live on a narrow street in a modest house, you and your neighbours could struggle to manoeuvre your vehicles. Fortunately, if you think your revamp won’t result in massive amounts of waste, you might be able to hire a mini skip in Brisbane. At Lightning Skips, we have skip bins in a variety of sizes to help you dispose of your junk quickly. We endeavour to deliver your skip the same day we receive your order. We will responsibly dispose of your waste to help the environment and avoid adding to landfills whenever possible. We’ll retrieve your bin as soon as you’re finished with it. That way you can enjoy your lovely front yard again as quickly as possible. Below, we discuss a few scenarios where it’s best to hire mini skips in Brisbane. As a business that takes customer service seriously, we want to help you find the right skip for your needs, and it’s not always necessary to hire the biggest bin available. Here are some situations where a mini skip will do just fine. One-room makeovers – If you’re decorating one room and don’t intend to dispose of large items such as wardrobes and drawers, a mini skip bin will likely have more than enough room to accommodate your waste. Mini skips can also be appropriate if you need to dispose of small furniture, but consider a larger bin to hold many big items. Small-scale landscaping – Sometimes, landscaping can result in significant volumes of waste, but if you’re only pulling up the lawn and disposing of a few garden items, you probably don’t need anything larger than a mini skip to hold all your outdoor junk. Spring cleaning – All homes become filled with clutter as the years go by, and if you’re doing a big spring clean, you might need more bin space than your wheelie bin offers. Fortunately, in this situation, a mini skip will do the job perfectly. At Lightning Skips, we pride ourselves on our prompt delivery, excellent customer service and high-value prices. We can deliver skip bins to most suburbs in Brisbane, from Northside to Southside! If you’re carrying out a small-scale revamp, touching up your garden or de-cluttering your home. Contact us today on 0472 975 477 to hire a mini skip from a company you can trust. Alternatively, you can go to our homepage find our booking form if you’d prefer to contact us online.